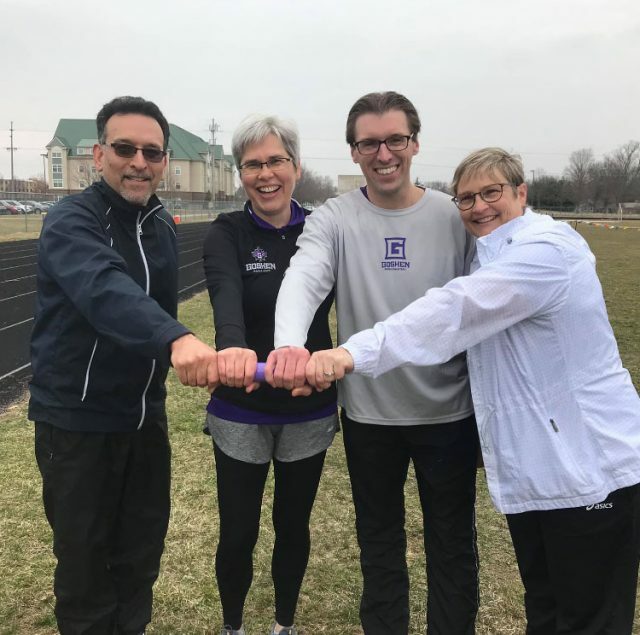 Students were lined up along the fence of the Eigsti track and field complex last Friday to witness something they may not see again for a while: President Rebecca Stoltzfus running alongside members of her Cabinet. Rustin Nyce, head track and field coach, said the intrasquad track meet was unintentionally created last spring when the track and field team’s early season meet was cancelled. “We threw the meet together quickly,” Nyce said. “The team really enjoyed it and suggested we promote it more to campus.” This year, the team hung flyers around campus and made announcements in club meetings to draw a crowd. The event is a way for students and faculty to come together and support each other while having fun competing. Due to limited outdoor facilities, the track and field team is not able to host regular meets during the season, so Nyce says this meet is a great way to act as a substitute. “From the team perspective, I hope the athletes feel like they have a chance to perform for their peers and feel the support we have on campus,” he said. Various GC sports teams and coaches were represented in the meet, including women’s volleyball, men’s basketball and men’s soccer. However, all Goshen students and faculty were welcome, not just athletes. President Stoltzfus and her team of Perez, Ken Newbold and Jewel Lehman made their appearance in the 4×100 meter relay race. When it came time for the event, Perez rallied the Cabinet team together, organizing a last second practice in the middle of the infield. Each member stood 10 feet apart, taking turns running towards the person ahead of them and getting a clean hand off of the baton. Despite the professional-looking warmup, Perez said that was all on the spot. “I’m not sure any of us did anything special to prepare for the meet,” he said. Despite the lack of preparation and slight athletic disadvantage, the team finished in third place. The friendly competition in front of students and fans cheering them on left the Cabinet wanting more for next year. For members of the track team, they competed in events they run on a regular basis or tried something new. Junior Vincent Kibunja showed off his speed and made history once again, running the fastest outdoor 3000 meters in Goshen school history with a time of 9:03.34, a 4:51 mile pace. In the mile, Kibunja had some unfamiliar company early on in the race as Jon Tropf, men’s head basketball coach, led the pack for one lap before dropping out 400 meters in from fatigue. Students and faculty competed in the 100, 400, 3000, 4×100 and more during the meet. With a vast difference in experience and ability, the event was an opportunity to compete, but most of all, have fun in the midst of a busy academic season. As for the future of the meet, Nyce is hopeful that it will continue to gain support and increase in participation. “Everyone is welcome — all campus folks, public, anyone,” Nyce said. So make sure to keep an eye out for the third annual intrasquad track meet in 2020.